Fake degrees becoming even cheaper! Following the recent posts on fake degrees from Universal Degrees who offer "degrees" from "Corllins University" and "Belford University" one of my many fake identities gets an email from them offering me an even better deal. Anyone with kids will know that they can sometimes be a little reluctant to take responsibility for their actions. You’ll catch them red-handed in the midst of a childish crime scene and they’ll deny all knowledge, blame the cat and or use any excuse that springs to mind to avoid the blame. Of course that all changes as children develop into fully-rounded human beings who are mature, sensible and grown up. Unless of course they become union leaders, BMW drivers or people working in customer service. These groups sometimes seem to think that they have no responsibility for the results of their actions, leaving a trail of impoverished, disempowered people behind them because they don’t understand the consequences of the activities. We see this so often when dealing with complaints from customers. Many organisations seem convinced that it’s impossible that they could have made a mistake, at least that’s the impression they do their best to give to customers even when it’s blindingly obvious that they’re to blame. They’ll come up with a range of excuses to divert responsibility. It was lunch hour so nobody was here, I wasn’t at work that day so I can’t help you, the boss isn’t here to explain the problem. All are diversions from the staff member taking responsibility for the problem. OK, you might argue that we shouldn’t blame the low-level staff member for not taking responsibility, surely the problem is higher up? You’re right, of course you are. It’s the leaders in an organisation who can authorise, enable, skill and empower lower levels of staff to take some decisions and yes, that IS a scary thing to do but it’s not impossible. I’ve known of companies where every customer-facing employee is entitled to make refunds up to a certain value. These refunds are recorded and analysed to make sure that nobody is going crazy and throwing away the company’s money but they’re a remarkably powerful way of saying to customers that the company values them. What’s worse is that even when a company can be shown to be in the wrong and have a problem to solve they still make it difficult by not just diverting the blame but reflecting it back to the customer. Some months ago we heard of a sports store who told a customer who returned some fancy shoes that were falling apart after a matter of days, that it was his fault for going dancing in them. These shoes, he was told, were NOT for dancing. So it was his fault that they were disintegrating. The store owners were very unhappy when we got involved and threatened us with fire and brimstone for reporting on their failure. Well, you may ask, maybe the customer and Consumer Watchdog were being unreasonable? You might think so but Levi’s, who made the shoes, agreed with us. No sooner than we had sent them a cellphone camera snapshot of the shoes than they apologised for the fuss and offered him an entirely free replacement pair of BETTER shoes that the customer now wears and that he describes as “beautiful”. Last week we had a great example of an organisation going out of it’s way to find a solution for a customer. It started when he bought some Mascom airtime from a branch of PEP stores and then forgot to take the airtime voucher away with him. Half an hour later, when he realised what he’d done, he rushed back but it was too late, the voucher had disappeared. PEP did what they could but weren’t able to reproduce the voucher and they suggested that he contact the Mascom call centre directly. He did this and while they were very helpful they initially said that there was no way to help since this was PEP’s problem. As you can imagine this was frustrating for the customer as he could foresee himself being passed repeatedly between PEP and Mascom to fix the problem. That’s when he came to us. I took a bit of a gamble and sent the full history of the problem through to a senior manager at Mascom and before I knew it I got an email from the consumer saying he’d had a call from Mascom. The senior manager I’d sent it to had taken this one personally. She did some digging, traced batch numbers, confirmed that the airtime hadn’t been used, supplied a new PIN number and advised the customer on what to do. A little while later she called him back to make sure this had all worked properly. She also promised to brief the call centre staff on this sort of issue so they knew the right procedure in future. She also apologised, saying she was really sorry that he’d been through all this inconvenience. I think that’s about as good as it gets. It’s been a long time since I came across an organisation that was prepared to go out of it’s way to fix a customer’s problem so well. There were no excuses, no pathetic explanations, no silly made-up reasons why this problem couldn’t be fixed. The interaction was, as he said, “solution oriented”. And don’t forget whose fault this entire problem was. His. This problem was entirely the customer’s. He was the one to blame for losing his airtime voucher, nobody else could be faulted, but he was hoping someone would help him out. And they did, in style. Why can’t more organisations react this way? She-Haam and her team at Mascom for going out of their way to fix problems. Last year at our school a guy came advertising his product on loaning money using the same rates used at the Bank. At our school six of us took loans. I took P12,000 first and later another P7,000 which had to be paid over in a year from May 2010. This year in May 2011 when l thought l was finishing in April, he said it has to go on for another year. Each month l have been paying P2,566 for the past 13 months. I cannot continue, please help me. I feel cheated as this will amount to over P70,000. We have demanded for the last year’s statements many times but he is reluctant to forward them to us. He only gave us the break down on what we are owing him. I’m pretty good at maths but I can’t make these numbers work out. I can’t find a way by which a monthly payment of P2,566 will enable you ever to pay off this debt unless the lender is charging an unbelievably low rate of interest and I seriously doubt that. I think you can safely assume that when he said he offered the same loan rates as the banks he was lying. I think you should continue to demand a full breakdown of the debt you have with this company, including a list of every payment and details of the interest rate they are charging. I also suggest that you get them to confirm that they are registered with the NBFIRA, the Non Bank Financial Institutions Regulatory Authority. That’s the body empowered to regulate money-lenders like this company. Let’s see what they have to say about this situation. I’ve asked them several times to explain what this all means but I’ve had no further response. I suggest that until you get a statement you shouldn’t pay them a single thebe. Also I suggest you complain to NBFIRA. I’ll happily help you draft the letter. Update 2: Just heard from the reader that she received a threatening text message warning her not to “try any tricks”. Call the cops! Harassment. I am aware of various notices one would see at supermarkets that says "please leave your personal belongings at your own risk". Is this acceptable? I think by accepting our parcels in the first place, the supermarket will need to take responsibility should anything happen to them .I happened to one day leave my grocery at one particular supermarket here in Gaborone. They gave me the parcel token but upon return I found that the parcel counter assistant had mistakenly given my stuff to somebody else. Who is to blame here? Luckily the store manager was understanding and had to replace the grocery at the store's expense. I think you were very lucky to get you groceries replaced by the store owner. Please let us know which store it was so we can celebrate them for doing the decent thing? I have great concerns about this business of leaving goods at the parcel counter, particularly when the store puts up a sign like the one you mention. Yes, I think they certainly ARE morally responsible for your property however they try to escape their legal responsibilities. Personally I always refuse to leave my bags there, certainly when I’m carrying something valuable like my laptop bag. On the other hand I DO understand the challenge presented by thieves and stores are within their rights to do something to protect themselves. However we’re also within our rights to complain about it when it’s irritating, insulting or when they lose things. Last week I went into an electronics store in Gaborone with my laptop bag over my shoulder and they stopped me and insisted I leave it at the door. I politely refused and explained why. They then courteously asked to see inside the bag and let me in. They even politely thanked me when I left so clearly it IS possible for stores to protect themselves without being rude about it. While I understand that stores face a problem with theft I also think that it’s up to the stores to come up with a way of protecting themselves that doesn’t suggest that all the law-abiding shoppers are thieving criminals. It’s their job, not ours. If they don’t they might just find that shoppers like you and me will take our money to stores where they don’t treat us like criminals. I am writing you seeking assistance and guidance on a company I used to register a company for me after seeing their advert in a local newspaper. I paid deposit as was their way of doing business. I paid two further installments, one in February and the next in March. The agreement was to pay the balance when I get the certificate. Up to now I have not yet gotten the certificate, its always a new story and a new employee. I wrote them a letter to complain and I just got an acknowledgement of the letter and nothing tangible yet. I have suffered monetary costs in following up, delays in doing business and frustration of not getting what I wanted. You’ve been patient enough. I suggest that you send them one last letter saying that unless you have the certificate or a full refund within 7 days you’ll be taking them to the Small Claims Court. My dictionary says that a liar is someone who tells an intentionally false statement. It’s not a lie if you’re mistaken, ignorant or confused. It’s a lie when you know for sure that what you’re saying is false. You need to understand someone’s motives to tell whether they’re lying. With scammers of course it’s simple. It’s fairly simple to tell when you’re dealing with a scam, the clues, once you know them, are easy to spot. Start with their identity. In normal circumstances real people don’t try and hide their identity. They obviously don’t disclose vast quantities of personal information but their name shouldn’t be a secret. Of course you might ask why my identity isn’t disclosed in this article? It’s true, my name doesn’t appear anywhere on this page but it only takes a moment of internet detective work to find out who I am. It’s not actually a secret. 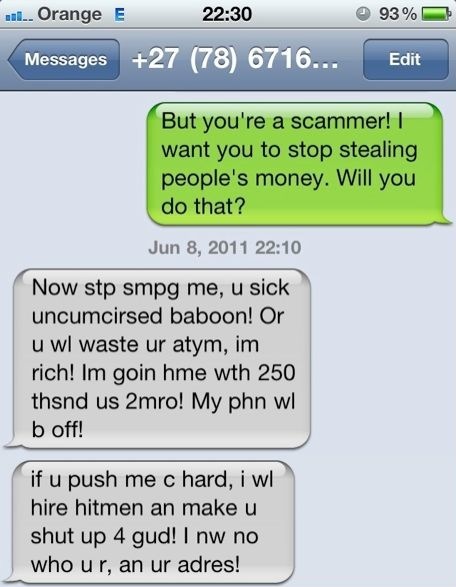 Here’s a tip about scammer’s names that might prove helpful. Many, many times we’ve seen scam emails and frequently they claim to be in the UK for reasons you’ll read in a moment. The clue that something’s not right is that they’ll put “Mr” or Mrs” in the name they use. They’ll sign it with something like “Mr John Smith” or “Mrs Mary Jones”. I grew up in the UK so I think I’m qualified to say that Brits NEVER do that. Brits never use “Mr” or “Mrs” that way so you know when you see it that the author isn’t actually British. Scammers use false names of course but they also use temporary, disposable phone numbers and email addresses. They always use cellphones, never land lines, and you’ll find that they often use UK numbers beginning with “070”. That’s because these numbers can be redirected to almost anywhere in the world. You dial what seems to be a number in the UK but in fact you end up speaking to someone in downtown Lagos. Oh and guess who pays for that call AND the redirection? You, the victim, do. It’s the same thing with the email addresses they use. They’ll all be of the free variety from providers like Gmail, Yahoo or Hotmail or some of the smaller rivals. Of course there’s nothing wrong with free email addresses, they’re wonderful. I have several of them, most of them for winding up scammers but also a personal one for those occasions when I can’t get to my business email address. But scammers always use them because without enormous effort by law enforcement they’re virtually impossible to trace back to a single person. There’s the other clue of course. Something for nothing. What organisation can you think of that does all this for you for free? That’s right. None. Of course there WAS a fee to pay, a mere R250 “acceptance fee” that you had to send. However, this scammer wasn’t one of the smarter ones. In fact he was a particularly stupid specimen who actually gave the details of a South African bank account into which you were to pay this fee. Needless to say I forwarded it to the bank in question here in Botswana and they sent it over immediately to their South African cousins and the account was suspended in a flash. I got in touch with the scammer using the SA cell number he’d given, just to see if he’d react to a bit of taunting. He wasn’t happy when I suggested that his scam had been exposed and he was perhaps understandably angry as you can see from the messages I received. Of course he might also have been angry because I mentioned that I’d told the bank about his scam and that he wouldn’t be able to use his account any more. That’s probably why he threatened to have me killed. Or perhaps just because he’s a nasty person? Obviously this guy is a liar through and through, there’s no doubt about that. But what about the gentler lies we’re told? Not ones that are designed to steal our money but just perhaps to give someone a quiet life? What about the person I know who came to Botswana with her husband and was told by the bank that it was “illegal” for a foreigner without a work permit to have a bank account. What about more recently when another customer of a bank contacted us saying that in order to renew her insurance with the bank she had to supply AGAIN all the original documents she had originally given them. No, this wasn’t a new insurance policy, it was just a renewal of the existing one. No, the bank hadn’t lost the copies of the documents they took the first time. The reason? “It’s the law”. Well it’s not the law, no it’s not. It’s something the bank official just made up on the spot. Or let’s be charitable, let’s assume that the bank had a new policy that required the customer to jump through additional hoops so she could give them more of her money. Either way the law had nothing to do with it. If the bank official had stopped to think for just a moment she would have known that, don’t you think? I’m sure that the she would have realised that continuing with the story about it being a legal requirement would have been an intentional falsehood. A lie in fact. Portia at Capital Securities reception for being very helpful. Dimakatso Duha at University of Botswana Transcripts office for providing exceptional and thorough service. The Botswana Couriers team in Maun staff for special assistance. We had bought a king size bed for more than P10,000 from a furniture wholesale store in the Broadhurst area. After one year, the base bed completely broke down to pieces and as I am writing this message, I and my wife are supporting the mattress with bricks. When we alerted the shop owners about this, they told us that the base bed had a 12 months guarantee only, and therefore there was nothing they could do. We bought this base bed in August 2009 which means the bed is almost 2 years old now, but we used it for just over 12 months before it broke down. We are therefore appealing to you to help us get a fair deal on this issue if you can. We feel cheated and humiliated. Unfortunately I suspect there is not much that can be done in this case. The warranty you were given, even though it was pitifully short, was a fair warranty so long as you hadn’t been, errrr…, shall we say “misusing” the bed. If you’d had problems during the first year then clearly the store should have remedied them but it’s now just too late. Personally I find it remarkable how shoddy much of the furniture is that stores sell. While they often look special in a store you only have to get them home and look under the soft covering to discover that they’re often made of scrap wood. When you buy furniture I think the lesson is to demand to see how it’s been made. Ask the people in the store to turn it upside down and show you the insides. There’s nothing unreasonable about this. You wouldn’t buy a computer without knowing a bit about it’s components and you certainly wouldn’t buy a car without taking it for a spin and looking under the hood so why not with furniture? This is even more important if you’re buying it on credit. And before you sign that credit contract ask yourself why the store wants you to pay for 2 whole years but will only warranty the item for one year? It can’t be because they are making massive profits from money-lending and realize that their products are rubbish, can it? On the 28th of May 2011 I bought a DVD player from a Chinese shop in Mogoditshane. I never had time to watch any DVDs because of my work so over the weekend, the 5th of June to be precise I thought of watching a movie since I was off, but the DVD player could not play it went on and off so I switched it off and thought of taking it back where I had bought it since it was still less than a month. I therefore think that is not fair and I am kindly asking your good office to help me with this situation and advice me on what procedure to take. Let me start by asking a question. When you bought this DVD player did you sign an agreement saying that the store could treat you like dirt? Did you sign something saying that you freely, voluntarily and without any pressure waived away your legal rights as a consumer? Did you sign a form saying that you would allow them to treat you with contempt and disrespect? I suggest that you go back to the store and explain to them that they have breached their obligations under the Consumer Protection Regulations 2001. Specifically they have breached Section 13 (1) (a) of the Regulations which says that a supplier “fails to meet minimum standards and specifications” if they sell something that “is not of merchantable quality”. If they don’t understand “merchantable quality” you can tell them it means “fit for the purposes for which commodities of that kind are usually purchased”. A DVD player should be able to play DVDs. It should just work. If it doesn’t work they must either replace it or repair it entirely free of charge. Simple as that. If this doesn’t persuade them ask them whether they want to be named so everyone knows how badly they treat their customers. A few weeks ago we reported on the debt collector who were avoiding paying their customer the money they had collected on her behalf. They finally paid up and reader is happy again. We also reported on a furniture store who had taken a deposit from a consumer for a bed but had failed actually to deliver anything. The consumer, being an honest guy, had nevertheless continued making payments. We got in touch with the MD of the store chain and within days the entire thing was sorted out and the customer was refunded everything he’d paid. See? It’s worth complaining and persisting until things get fixed. It's amazing how many complaints are posted to the Hello Peter web site in South Africa regarding holiday club timeshare schemes. The most common complaints seems to be misrepresentations in the initial presentations, the lack of available holidays and the difficulty you have in escaping their clutches. See these links for examples. Be warned. Workerhire is very suspicious. I don't trust any organisation that requires an up-front payment before they actually DO anything. Workerhire require a "One time Registration fee of $USD 170.00" before they'll actually try and find work for you. That's simply not the way genuine recruitment companies operate. The real ones charge the company with the vacancy once they've successfully filled it, not the recruit. The last thing I find suspicious is the References page on their web site. 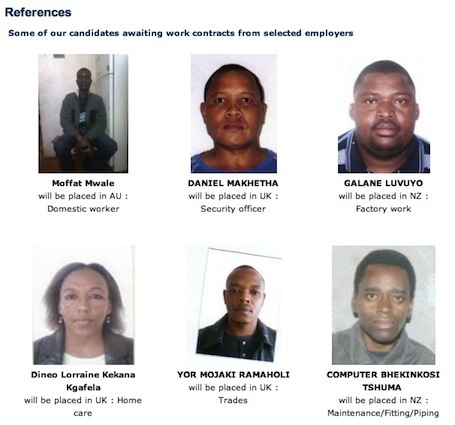 I simply don't believe that they've placed people in the UK as a "Warehouse clerk/assistant" or "Home care". It's just not believable. And it's not just me who thinks this. I’m on holiday as I write this. Away from home for a few days, enjoying the silence of the bush, enhanced only by the sound of kids playing and the occasional cork being removed from a bottle of wine. But not everyone has such a positive experience on holiday. In fact some holiday ideas can turn out to be nightmares. We’ve reported several times in the past on various holiday club schemes that have plagued consumers, causing them emotional trauma and significant financial hardship. Most holiday clubs are effectively mobile timeshare schemes. You buy points that you can later spend on holidays at the locations they offer. Superficially this is a perfectly acceptable concept. There’s nothing wrong, in principle, with a timeshare concept. It’s just a shame that almost always it turns out to be oversold, a con or a scam. The information timeshare salespeople provide is full of pictures of glamorous locations, sandy beaches and glorious sunsets being watched by happy, beautiful people. It’s very seductive. Very often you’ll meet the salespeople when you’re already on holiday in the place of your dreams, knowing in the back of your mind how expensive it all is. You’ll be sitting there with a fancy cool drink with a little umbrella with your loved one, fantasising about spending more time in such a beautiful place. That’s then the creepy salesman creeps out from beneath his creepy rock. How would you like to come here more often he’ll ask? All you need do is sign up for our scheme and pay a simple annual fee you can choose from a range of beautiful places like this and come as often as you choose. After another of those fancy drinks you’re in a presentation surrounded by other happy smiling people who all want a bit of the holiday action as well. Before you know it you’ve signed on the dotted line and they’ve got you. That’s when the victims often begin to realise that they’ve been suckered. To begin with these holiday club schemes are based on a false premise. They’re not a cheap way of taking a holiday. When we’ve actually looked at the details we’ve almost always found that they’re no cheaper than going to your friendly local travel agents and asking what last-minute specials they have on offer. You’d be surprised at the bargains they’ll offer at the last minute. They’re certainly cheaper than the financial commitment demanded by holiday clubs. Even the initial sales job is often deceptive. I’ve heard of cases when everyone else in that presentation was in the pay of the timeshare scheme, just there to help catch one victim. They certainly make enough money to pay everyone some commission. Even the holidays they actually offer you are disappointing. Very often the locations you want aren’t available at the times you need. Public and school holidays are either not available, require you to spend more points than other times of the year or they’re simply booked way ahead of schedule by other people. There was a case in the USA that finally reached the courts some years ago when it emerged that all the prime slots in the calendar were reserved as bonuses for the sales team. The victims, sorry, members never stood a chance of getting them. Then there are the contracts you sign with these schemes. A few years ago we received a series of silly legal threats from The Holiday Club promising us legal action when we reported on their “irrevocable” contracts. These contracts, the victims were told, were for life. There was no way to cancel them, not once a 5-day “cooling off” period had expired. Of course a 5-day opportunity to change your mind is next to useless. That 5-day period almost certainly expires before you get home and let reality sink in. I saw one contract that required any change of mind to be submitted, in writing, to an address in KwaZulu Natal within the 5-day period. Effectively the cooling off period was impossible to use. Even when customers wanted to cancel their membership at a later date and even when they were prepared to waive the membership fees they had paid, all the annual fees and the points they earned, they were told they could only cancel the contract with the permission of the Club. Needless to say this permission was remarkably slow to arrive. Of course the threats we received came to nothing because we’d only reported the facts. Yet again bullying tactics didn’t work. Since then we’ve reported on a variety of similar schemes but the problems were often the same. Just last week we heard from a reader who had a problem with a company called Holiday Access. It began with problem actually paying them but when things became so complicated and he decided to cancel his membership he was apparently told that he’d signed a 3-year contract and there was no way to cancel it. He was warned that if he stopped paying they’d set their lawyers on him. This is despite him having had absolutely no benefit from the scheme since he joined. I think it’s simple. The benefits of these clubs are either non-existent or marginal. The contractual conditions are often incredibly one-sided and exploitative. The costs are often excessive. Why would you want to burden yourself with such an obligation? If you want a decent holiday I think the last thing you want is a holiday timeshare scheme. Korabo at Orange at the Bus Rank in Gaborone who our reader says is a “shining star who went above and beyond the call of duty to keep me as a customer”. I bought a bed at a furniture store in Molepolole in 2010 October. After 3 weeks when I was asleep the bed made a funny noise when I turned and it sinks in the middle. Everyday I wake up I am tired with backaches because I have to sleep in the middle and it is sunken. I reported the problem to the shop before December and they promised to exchange it. Even though I have paid for delivery initially they expected me to transport the two beds for myself (the one from my house and the exchange one). We discussed the issue but later the manager promised to deliver for me but only after a week as their delivering van is elsewhere. Weeks passed with no delivery. In December I called them I asked them to let me transport the bed for myself and the manager agreed but she later called me to tell me that their boss has ordered them to wait and not let me transport it for myself as she will be coming the following Monday. On the Christmas week I called them reminding them that I am still waiting and to my surprise they told me that they aren’t offering exchanges as they have limited stock. In April I learnt from a friend who also has the same problem that the shop is now closed and it’s advertised for rent. She told me she called the manager and she told her that they have closed the Molepolole branch and only left with Gaborone and Kanye branches. I tried to call the manager but didn’t pick the phone. I called the store owner and we had a long chat and she explained her problems with suppliers, the shortage of replacement beds she was facing and also that she had tried to fix the problem on several occasions but that there had been some communication problems between them and the customer. I suggested that she and the customer have a quick chat on the phone and within minutes I was receiving messages saying the problem has been resolved, a new bed will be with her the following day. The lesson is that sometimes communications break down, misunderstandings develop and then people become angry. That’s when it’s sometimes useful to turn to us as a neutral outsider. Despite what people often think we don’t always take sides. Although I sometimes love a good fight I much prefer it when a consumer and a supplier sort out a problem on good terms. We’ve heard of this so often with holiday clubs and it seems like this bunch are no different to the others. They trap you in to a contract they claim you can’t escape and they really, really want your money. If you do a quick search of other consumer web sites (Holiday Access, Flexi Club, Holiday Club) you’ll see that we’re not the only ones warning people about holiday clubs. If you fancy some amusement you can also see some of the threatening letters we got last time as well as our very polite letters back to them suggesting where they could stick their silly threats. 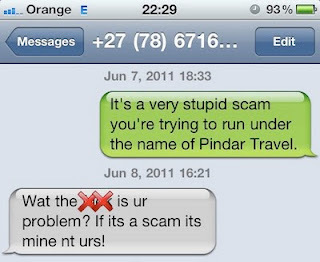 The moron running the "Pinda Travel" scam isn't happy that he's been exposed. Last time I checked I wasn't a woman. Pinda is now recruiting we pay everything for you to go abroad because volunteering is free. All you pay is the registration acceptance fee of R250 ..."
He's a scammer. He deserves no respect. Don't give him any! We’re in prison. No, I don’t mean the Consumer Watchdog team although there’s a list of companies and their second-rate lawyers who no doubt wish we were. I don’t think this drop in threats is due to use being gentler with crooks, cheaters and liars, or not criticising companies when they deserve it, I think it’s just that even the less respectable companies are realising that threats of legal action have little effect on us, other than to make us laugh out loud and to know we’re onto something. There’s been an interesting parallel in the UK recently with the disastrous efforts of so-called celebrities like footballer Ryan Giggs to suppress coverage of their indiscretions. They’ve sought and obtained what the Brits call “super-injunctions”; rulings from their Courts preventing the media from detailing their bad behaviour but also, and this is the sneaky bit, even suppressing the coverage of the injunctions. In the past the press have been able to say that they’ve been prevented from publishing something (without saying what) but now they can’t even say that a court action took place. Needless to say in these internet-enabled days the super-injunctions were comprehensively trashed by the users of Twitter all over the world. A week before the story broke even I knew that it was Giggs who had been to court. Of course the blame must go to Giggs’ lawyers as well as to him. They should have known by now that technologies like Twitter are instant, global and almost unstoppable. Within minutes of an event happening the news can be on the other side of the planet. Even in our own small way, our blog, Facebook group and Twitter feed get our articles, observations and consumer alerts out to people within seconds. Things have genuinely changed. The lesson is that the way in the law can be applied is different these days. The internet knows no boundaries outside of China, North Korea and Burma. So why are we in prison? I think it’s all of us who are imprisoned. I think we imprison ourselves and unfortunately a number of industries do their best to keep us incarcerated. This came up in a conversation with a colleague when we were discussing why it is that bank customers sometimes put up with such miserable service. I don’t think that it’s all because they’re naturally submissive, lack confidence and don’t know their rights. I think it’s often the very nature of the building they enter. More often than not when you go in to a bank there is a barrier between you and the person serving you. Sometime that barrier even consists of bars like those in a prison cell. How on earth are you meant to make a “connection” with a bank teller when one of you appears to be behind prison bars? But I think it’s actually worse than that. Who exactly is the one in prison in that situation? You might immediately assume it’s the bank teller, they’re the one sitting still behind the bars but ask yourself this: which one of you has the most freedom of movement? It’s you that’s the prisoner of the bank when you’re standing at those bars. Couple that with a sometimes endless queue and you can see how anyone entering a bank can quickly become institutionalised. It’s no wonder you end up acting like someone wearing handcuffs and shackled at the ankles. It’s no wonder that many of us can’t pluck up the courage to argue with the prison guards, to complain about the treatment we get and to insist on a better quality of service. It’s also no wonder that many bank tellers act like prison warders, bossing us around, doing their best to get rid of us as quickly as possible and treating us like we’ve committed a crime when we ask them for something. Of course some of them make it slightly different for their non-cash transactions. When you go to open an account you are often invited to sit as a desk but again that’s only after sitting in an endless queue, waiting patiently for your turn to get the warder’s attention and then again being treated like someone on death row. I’m not entirely sure what the alternative is and I’m certainly not suggesting that banks should abandon their security measures. I don’t want them robbed any more than they want it themselves. But surely there are imaginative ways in which the feeling of being a guilty convict can be avoided? I know of one bank, admittedly a rather quiet one, where the bank tellers are almost in a back room. There’s a reception desk and a series of desks where you can talk to someone who knows a bit about what you want. It doesn’t seem quite as sterile and unfriendly as the brand new prison, sorry, bank branch across the mall. I can sense that a bank employee reading this is going to point out that it’s similar in other industries but no it’s not. I can’t think of any organisation that I enter willingly, and where I have a choice of competitors that behaves this way. So here’s my suggestion for the week. Go and rent, buy or borrow (but certainly don’t download illegally) a copy of The Shawshank Redemption and see how you can escape from the prison your bank has put you in. I have an argument with a furniture store. I started having credit with them when I was at University and my income was my allowance which came to an end obviously at the end of my university days. They called me asking me how am I going to settle my credit and to my knowledge they have some policy which takes care of any balance for my account if I encounter instances where I do not get income anyhow; say retrenchment etc, they call it Account Balance Protector, this is some sort of insurance they provide in store. Customers subscribe to this insurance with knowledge maybe similar to mine. I get calls from people claiming to be agents for them insisting me to pay and I asked them to send me statements from my last payment to date, take note that they never sent any statements in a very long time. I believe they stole my money by making me subscribe to policies that are of no use to me. Yes I agree I owe them but they have put the credit to now almost two and half time the original i.e. from P1,000 to about P4,500. Please advise me on how to go about the situation? The protection schemes offered by furniture stores and other organisations such as banks only cover those instances that are unforeseeable, like retrenchment. They don't cover situations that are likely to occur. It's well known that graduating students don't always find employment immediately; it's not the fault of the furniture store that you haven't found work or a source of income. There is a little bit of good news. The "in duplum" rule states that at the time of settlement of a debt, the interest paid may not exceed the outstanding capital balance. If you owe a capital amount of P1,000 they cannot add more than P1,000 in interest on top of that. However they CAN also charge reasonable administration and legal fees. Meanwhile, you are obviously entitled to a full statement that describes the alleged debt including a full breakdown of all the charges they claim you owe. I suggest that you demand a full and detailed statement from them and explain that you know you have a right to receive this before considering making a payment. You're not going to be able to avoid repayment of this debt but you do have some protection about how much you can be forced to pay. Please advice me on what to do. I bought a fridge from a furniture shop in Molepolole and I paid all the money of our contract. During the last month of my contract, the fridge went faulty and was not functioning up to expected standards, so I reported it and it was taken for repair around July 2010. I waited for the fridge until March 2011 when they contacted me and told me that they are going to replace it. Then I went to the store where I was shown a slim 250 liter fridge on display to replace my 305 liters fridge. I expressed my dissatisfaction about the size of the fridge, but they said there is no way they can help me. So whats my next step now? Your next step is to get in touch with us! The store have clearly let you down. To begin with they took EIGHT months before they told you that they would do something to help you. I can’t understand why it needed to take that long, there’s no justification for that. And then to tell you that they’re going to replace it with an inferior product? I think not. However, there is an important thing for readers to remember. In this situation the store is not obliged to give you a new fridge. Their obligation is to get you back to the situation you were in before the fridge went wrong. Ideally they would replace your fridge with an identical model of exactly the age and condition. If it was 11 months old they should replace it with an 11-month old fridge. Clearly that’s impossible but it’s got to be something as close to that as possible. It certainly should NOT be anything inferior to your 11-month old fridge. Of course the store might argue that a brand new but smaller fridge has the same monetary value as your larger second-hand one but that’s not relevant. They should replace your fridge with something that does the same job as your faulty one. In other words it should be roughly the same size. I suggest that you write to the store and say that you’re rejecting their offer of a smaller replacement and that you require them to replace the faulty fridge with something of a similar size. What does it cost for you to help me solve my problem with a store? It costs you nothing at all. Everything Consumer Watchdog does is done entirely for free to consumers. It always has been, it is now and so shall it always be.